This French Onion soup recipe comes from my dad. He found it in an old recipe book of his grandma's and tweaked it until it worked for him. Apparently, I come from a whole family of tweakers. -4 cups consomme (fancy word for beef broth) I have also used chicken broth when I didn't have beef and I've mixed chicken and beef broth and that really gives the soup a great flavor, so feel free to use what you have on hand. In a sauce pan, melt the butter. Add the onions, salt and pepper. Saute the onions until they're light brown. In a medium size kettle, add the entire contents of your pan and the rest of the ingredients. Simmer on a low to medium heat for 30 minutes. When dishing out your soup, add croutons, dried bread, or my favorite, a slice of french garlic toast. Top with some mozzarella cheese and let the heat from the soup melt it in. 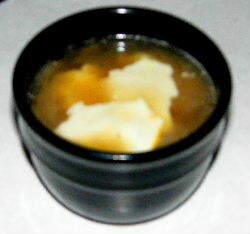 Click here for more great soup recipes like French Onion Soup!